Christmas is a time for giving and sharing. It’s season of goodwill to everyone. A time for fun and festivities – when carolling, hymns or just a good old sing-song can bring joy to the world. We all have a favourite Christmas song, one that reminds us of those frosty Christmas mornings, bounding down the stairs, leapfrogging stairs two at a time as we simply cannot wait to get the day underway. For those in elderly care, the festive season can be a particularly divisive time of year. Yet everyone should celebrate and enjoy Christmas – which is why the Once Upon a Star Christmas variety show is a great way to get everyone in the Christmas Spirit! This December, Flixton Manor Care Home has invited the Strictly Entertainment Once Upon a Star show to come and visit our residents and take a musical journey through much-loved Christmas classics, seasonal songs and carols. Since 1998, Strictly Entertainment has entranced care homes across the UK with quality entertainment. This holistic healthcare entertainment has proven to have positive psychological, emotional and spiritual effects, helping heal and comfort residents in elderly care. 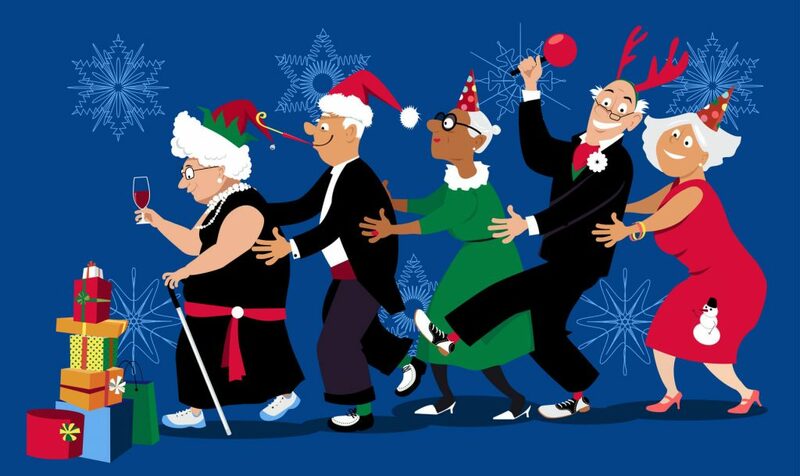 Having brought glad tidings to resident homes across the UK all year-long, Strictly Entertainment has happily agreed to come to Manchester nursing home, Flixton Manor this holiday season and bring a little Christmas sparkle to everyone. Led by international award-winning cabaret artist, Sadie, the Once Upon a Time Christmas variety show promises to be a stunning showcase of musical reminiscence at its very best. Our residents will be taking a musical journey through much-loved Christmas classics, seasonal songs and carols. ‘Let it Snow’, ‘Winter Wonderland’, ‘Mistletoe and Wine’, ‘White Christmas’ and ‘Silent Night’ being just a few of the songs performed. Everyone is invited to come and along to Flixton Manor and share in the Christmas cheer on Tuesday 12th December. The fun starts at 6:30pm! Hear the Christmas hits from yesteryear with numbers from Dean Martin, Perry Como and Bing Crosby complemented by popular contemporary jingles from Kylie Minogue and Michael Buble. When we’re all tucking into our mince pies, trimming the tree or exchanging gifts that it’s easy to forget those that are less fortunate than us, or who are spending Christmas alone. Times of loneliness can leave the elderly isolated and unhappy during the festive period. Engaging events like the Once Upon a Star show can make all the difference to someone’s Christmas. Music, especially structured musical variety performances, act as a form a therapy. Acts make connections and offer auditory and visual stimulation. This helps ease anxiety, redirect attention, stems restfulness, whilst promoting peace. Not only that but, the experience and goodwill can be shared with your fellow man. After all, isn’t that what Christmas is all about? Flixton Manor is a Manchester nursing home synonymous with progressive care. We have more than 25 years’ experience improving the quality of life for dementia patients. Learn more about us today by calling 0161 746 7175, where one of our friendly staff would be happy to help you.